Cecilia is a fishing town and is the home to over 40,000 residents. 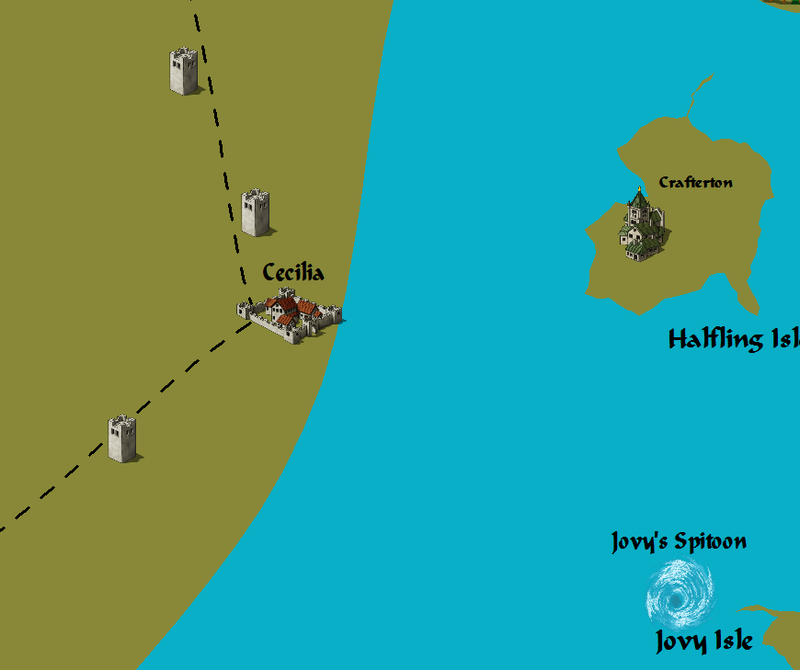 Cecilia acts as Xoria’s main trading port with Persia and the other cities of the Magical Lands. It is the most diverse place in all of the Magical Lands due to the many different cultures that come to Cecilia to trade, but also due to the strong tourist attraction due to the city’s seaside nature. Cecilia is named after the daughter of Zeus and one of his mortal liaisons, Hymniara. The original Cecilia followed both Artemis and Zeus as her patron gods and became a heroine to rival Theseus in her accomplishments. She rid the Caspian Sea of the gigantic monsters that made it impossible to fish or row a boat across it. She founded the first fishing town of the Caspian Sea and named the village after herself. Cecilia led the village and protected it from the smaller sea monsters which emerged from the depths until she died. Merfolk, Sahuagin, and other humanoid races of the water honor Cecilia because she killed the great sea serpents that kept the aquatic races’ populations small. The town of Cecilia has become a sacred place for the underwater races and because the town is considered hallowed ground it has become the official place to conduct peace talks between the different races of the Caspian Sea when such things are necessary. Almost all the religious rites of the aquatic people are performed on or near the beach of Cecilia. The races of the water allow landwalkers to view their ceremonies, but have imposed the rule that all tourists respect them and follow proper rules of etiquette to watch the rituals without repercussions. A small pamphlet that details such rules is sold by the city to those who wish to view the elaborate water rituals. As one might guess from Cecilia’s waterside location the main businesses of the town are fishing and trading. The town has the largest civilian fleet on the Caspian Sea and it needs protection both from the weather and from the beasts that live in the ocean. Spellcasters capable of weather control are in high demand in Cecilia. The demand is so great that the clergy of Aeolus set up their main temple there. To deal with the underwater threats such as Sahauguin, Nagas, Dragon Turtles, Merrow, and other beasts of the sea a chapter of the Mercenary’s Guild from Phoenix opened in Cecilia. At the start of the Second Alliance War the Xorian government took control of the guild and conscripted or enslaved all of its members. The diet of the townspeople consists mostly of fish, sea urchins, and seaweed, but also includes staple crops and fruits grown inland to the west by independent farmers. Persian spices and other delicacies are served daily on the tables of the rich and served more often than one would expect on those of the common folk. The classic dish of Cecilia that every visitor tries is the meat of a plesiosaur served with cayenne pepper from Persia. The interesting combination is something the locals have grown fond of and tourists are wary to eat twice. The government of Cecilia is headed by Commodore Taydasa. Taydasa is the son of the previous lady in charge of Cecilia, Shinagana. Taydasa replaced his mother when Jevaninada II’s reign began. He is in control of the city’s docks, administration, and the navy, but Taydasa prefers his administrative duites over his naval ones. His subordinates compensate for any duties he cannot perform while distracted by his other jobs.